My usual approach to these Caribbean Voyage CD’s is to attempt to characterize the music by its various cultural influences and more often than not I’ve used an imperfect classification system where American/Caribbean music is placed along a spectrum of influences - African to European. My hope has been that people will be able to gather, from my simple descriptions and classifications, ie 'more European' or 'more African', enough information to decide whether or not they should give the CD a listen. While I certainly could take the same approach in reviewing this CD, I think it would be a little more interesting to try something new. 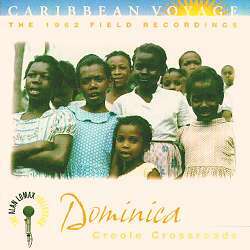 However, first let me say that like the other CDs in this collection, this is a wonderful collection of Caribbean music, with its share of scratchy voices, wheezing accordions, and drums thick to the ear, all recorded with excellent sound quality. That said, we can move on. Let me first say that I knew next to nothing about the Caribbean island of Dominica upon receiving this CD. These are the things I did know: I did know that it had been occupied by both the British and the French at various times in its history and that it is largely populated by the ancestors of former black slaves, with a small Carib Indian population. I also knew that it had a modern music called Cadence-lypso whose sound lies between English Caribbean soca and French Caribbean zouk (as I had in my possession a few CDs of this music before I received this volume). That was about the extent of my knowledge. And really, to be fair, that is a lot to know for someone with no connection to the island. Still, as I didn’t know much I turned to our friend the Internet for information. Most of the sites I found were travel websites with descriptions and pictures of this 'nature paradise', but with very little substantive information on the culture, people, history, or music of the island. There is one site that promotes a World Creole Music festival which takes place on the island. This website provides brief descriptions of various musical genres found on the island, primarily the modern genres of Cadence-lypso and Bouyon, which mixes modern musical expressions with traditional Dominican music. There are six worksongs to be found on this CD, all but one sung in French Creole. The activities intended to be with the song include sawing, chopping, boat pulling, and rowing. All the songs are sung by males, either solo or in group. We don’t have worksongs anymore, at least not where I live. I don’t know if that’s because the nature of our work has changed - I suppose it is more difficult to sing a tune to the click of a computer keyboard - or because we have changed. The truth of it is, many of us continue to do 'physical labor', but we are no longer singing while we do it. True, some of us listen to the radio and sing along, but the music seems to be independent of the work itself. Tell them, don't call for us! Oh, we're really sawing today! Simple, direct, beautiful. The funny thing is, I, who love worksongs and have been listening to them for years, rarely think to sing them myself, at least not in the context of work. This past summer, I was out on a ranch in Mexico helping my uncle clear a path for a road. Axe in hand, I didn't sing a single song, neither one I'd heard before nor one I'd made up. Of course, what I've said isn't true. We do still have worksongs, and some of us do sing them, but I am at times amazed at how scarce they have become. There are two quadrilles, one mazouk, six lancers, and one jing ping dance on the CD. Jing ping is a type of music native to Dominica as well as the name of groups that perform figure dances on the island. Line-ups generally consist of accordion, banjo, and various percussion and base instruments including the tamboo, chac-chac, and boom pipe. Having grown up in the Southern region of the United States, I used to dance figure dances, particularly the contredanse, known there as square dancing. As a child, I never could have imagined that these European figure dances could be found in so many varied places in the Americas. Of course, the figure dances on this CD sound different than the music I used to dance to. They are more rhythmic here, with a distinct Creole sound typical of figure dances found in the Caribbean. The use of accordion and percussion also separates it from many of the figure dances found in the Southern United States. In fact, the use of accordion to play figure dances seems more particular to Dominica and perhaps Haiti, than to any other islands in the Caribbean. In other islands, string bands are the ensemble of choice for playing figure dances. Listening to the figure dances found on this CD and others in the Caribbean Voyage series, I have been impressed with the similarities between the percussive styles of these quadrille groups and percussive styles of the Spanish Caribbean. The drumming on selections from the Carriacou Sampler CD sound very similar to the drumming found in the plena music of Puerto Rico. On this CD, I was surprised by how much the lancers dances, particularly track 19, sound like a rural style found in eastern Cuba, called Changui. There is one storytelling song on this CD. The story is told by an elderly gentleman and a group of children provide the chorus. The energy behind the storytelling and its musicality are impressive. When I was a child I used to have a favourite storyteller who lived not too far from me. Her talent for storytelling was well known to us children and in particular her ability to include the listener in her stories. Before beginning any story, she would first ask her listeners what they wanted to hear a story about. One of us would shout "ants," and another "triceratops." She would then weave a story around our suggestions often naming her characters after the children who had shouted out. She did not tell storytelling songs, certainly, but when I hear the chorus of listeners in a storysong, I think of how fun it would be or would have been to participated in these story songs, and then I think of how fun it was to listen and participate in this woman's stories. I’ve heard other storytelling songs. A beautiful one from Martinique can be found on the Caribbean Voyage sampler. I have also heard storytelling songs from Lousiana, told in English but found in a region with considerable French influence. The booklet notes of this CD tell us the that kont or storytelling songs are only told in French Creole in Dominica -I am left to wonder if there is some particular connection between the speakers of French Creole in the Americas and storysongs. Of course, African-based Ananci tales/songs as well as other African-based storysongs have been found throughout the Caribbean and in Central and South America, regardless of the language of the country, so I suspect the major connection is an African one. I also have a long held a suspicion that rap music, which primarily originated on the streets of New York, a city with considerable Caribbean influence, has at least part of its roots in the storysong and sung poetry traditions of the Caribbean. There are four wake songs on this CD. Funeral songs and wake songs can be found in most cultures. In some cultures these songs are exclusively performed/sung at wakes while in others they may be considered wake songs but are performed in a variety of situations. In the Americas, including the Caribbean, there was a strong wake song tradition, particularly amongst the black populations. The wake songs range from sad mournful songs to religious based songs, to joyful dance songs. My mother is a thief. My mother lies to you. My mother is a rascal. So everybody will be happy. It's such a loving song, really, and my heart is happy whenever I hear it. Yes, I would prefer songs like these to the elevator music found in most funeral homes, or even to the funeral masses of Mozart and Brahms. Don't get me wrong, I love the Requiem, but it is something to listen to in life, not to have around me at my death. Much of what I've been saying may sound overly sentimental or nostalgic, though that is not my intention. Recordings like these remind me that we can all play music, that we do not need to be rock stars, or even have instruments, to express ourselves through music. Most of us have hands, we can clap. Most of us have feet, we can stomp. Most of us have voices, we can shout and sing. I hope that some of us use our hands, feet, voices, tupperware, etc. to sing old songs and create new ones that speak to our humanity as the songs on this CD do.